A Dominican Chimichurri will always be served with a cold frosty beer. Chimichurri (often shortened to Chimi) is the Dominican hamburger, which borrows the name from the famous Argentinian sauce. It’s not clear why the coincidence in names, as it is the only thing they have in common. Some time ago I made the distinction between the art and science of different types of food preparation. My basic premise was that cooking was more of an art, whereas baking is more of a science, with certain exceptions to that rule. Something we frequently mention in passing, but have not tackled in depth, is the art – or is it a science? – of serving beer, iced to perfection, Dominican-style. Dominicans are famous for their laid-back approach to most things in life. Pursuit of pleasure is a national sport in this lively Caribbean culture. People as a rule do not dwell on the negative, despite the fact that life for most is far from easy. The hardships of life are shrugged aside with comments like “¿y es fácil?”, and the fun begins. When people get together whether for la chercha (lively gossip and chitchat) dancing, a heated tertulia (debate, usually about cultural topics), a game of dominoes, a hearty meal, a trip to the river or the beach, the beers are put on ice and are downed as an inseparable part of the experience. Make no mistake: despite the setting, drinking beer is no carefree pursuit but a serious and meticulous business that has to be done in the precisely correct manner. It has intricate rules and regulations, and a long list of quasi-scientific terminology. Wine snobs beware: you have serious competition here. Before you look down your rosy noses at Dominicans who serve their red wine chilled, check the temperature of the beers you are serving! Up there with serving easy-cook rice (spit!) and instant coffee (seethe!) one of the greatest social gaffes one can make in Dominican company is to serve a beer that is anything but ‘en el punto’. This is where the refrigeration and serving of beer becomes both a science and an art. A Dominican drinks his or her beer just short of freezing. If ice crystals start to form or the foam begins to freeze, it is too cold. In colmados, bars and restaurants the beer is refrigerated in special fridges, something in between a fridge and a freezer, which keep the bottles at the optimum temperature. In Dominican homes, the beer is ordered from the colmado ‘bien fria’ (very cold) but is still placed in the freezer compartment for a good few minutes before serving. Dominican beer is pilsner beer, which is traditionally served ice-cold all over the world, but it is not unheard of to be served a beer at room temperature in certain countries. Now for my obligatory bit of Brit-bashing: in the UK traditional beers like bitter are served ‘warm’ so some people there still make the mistake of serving lager (pilsner) that is not sufficiently refrigerated. Even in Spain where some bars and restaurants take the trouble to ice the glasses before serving the beer, it sometimes happens that they run out of cold ones and think nothing of handing you a warm bottle, to the extent that both myself and my Presidente-worshipping husband all but totally give up beer when we are outside the DR. This would never happen in the DR, where even a bottle that appears to be nicely sweating in the heat can be returned with a sneer, universally recognised to mean ‘not cold enough’. There is an entire terminology around the cult of ice-cold beer consumption: Most people simply say ‘una fria’ (a cold one) when they ask for a beer, just in case there was any confusion. The coating of ice that forms on a perfectly iced bottle is reverently called ‘vestida de novia’ (in bridal gown). Another commonly-used expression is ‘ceniza’ (ashen). I have already mentioned ‘en el punto’ meaning the exact point of perfection, before the ice crystals form. ‘Caliente’ which literally means hot, is the disdainful adjective applied to a beer that has been out of the fridge for just a few minutes. The ‘hot’ dregs are discarded and a new bottle – resplendent with a frosty coating – is requested. Art or science, this is one area where Dominicans deserve a Nobel Prize, to put up on the shelf along with our recently-acquired first Olympic gold medal, if not for the quality of the beer then for the way it is served. Chimi is not usually prepared at home, but bought from street food stands. A Dominican Chimichurri recipe is hard to come by, each stand has its own recipe, seasoning, secrets and fans. It’s impossible to find a standard recipe, but this will allow you to make it at home with successful results. 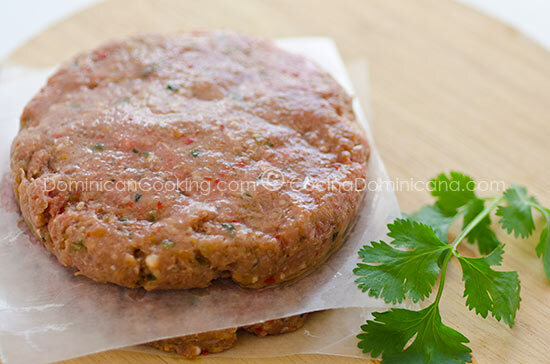 Chimichurri Recipe (Dominican Chimi Hamburger): a sauce-dripping burger made throughout the Dominican Rep. in street stands, each with their own and flavor. Mix the ketchup, mayonnaise, orange juice and Worcestershire sauce. Set aside (keep chilled). Pulse onion, garlic, bell pepper, salt, pepper and Worcestershire sauce in a food processor until you obtain a coarse paste. Mix the seasoning paste with the meat. Divide meat into 6 portions and form 6 patties (round for hamburguer bread, oval-shaped for pan de agua). Brush a stove-top grill with some of the oil and heat over high heat. Grill the patties, rotating until they are cooked through. Reserve. Reapply oil to the grill, and grill onions and tomatoes. Mix the cabbage with half the sauce made on step 1. Turn down the heat to medium and briefly cook the cabbage. Reapply some oil to the grill and warm up the bread. Put meat in the bun, top with the cabbage onions and tomatoes, and garnish with the remaining sauce. Chimi is traditionally made with pan de agua (a Dominican bread similar to mini-baguettes, but using burger buns is also very common. Use what you find. I’m Dominican and this is the way I remember a Chimi to be, back when I was living in DR. Not the ones they sell here in the US on the Dominican Food Trucks!. Thank you! Wao mil Gracias ! segui esta receta y me quedo delicioco. Que buen sabor cojio la carne. Me quedo mejor que los que he comprado aqui en en Orlando FL. Muchas bendiciones y gracias por compartir todas estas deliciosas recetas. Me encantó oír que te gustó. Gracias por compartir tu experiencia. I recall eating these at el monumento in Santiago; it was one of our family’s favorite outings. However, I remember the cooks/chefs would split some kind of sausage and grill it over charcoal. Do you know what kind of sausage they used & what would be a comparable sausage in the US? Thanks. It’s the sauce in this recipe, or at least an approximation. The sausage is called longaniza, you can get it in supermarkets that sell Dominican products. Longaniza is something completely different. This not the chimi recipe I was looking for. Used to eat them at el monumento in Santiago. They split a sausage, grilled it over charcoal, added chimi sauce & cabbage and served on pan de agua. This was addressed in the introduction. What kind of orange juice is it? Is it normal orange juice or jugo de naranja agria? It’s always regular orange juice unless otherwise specified.